Whether you work at a small startup or large corporation, you’ll probably have to give a presentation at some point in your career. When I begin creating a new presentation, I’m often overwhelmed by the possible layouts, themes, fonts, etc. There are so many options, and it’s hard to know what design choice is better than another from first glance. The following tips will help you get a better handle on principles of great presentations so you can design stunning and effective presentations without getting lost in all of the options. Align all the text. Though subtle, a centered title with lefthand text throws off the eye. In general, it’s much easier for the eye to scan the screen when the alignment is consistent. If you really want to play around with alignment, make sure it matches the content and maybe add an image to break up the text. Big images are better. People sitting at the back of the office can’t always see tiny little pictures in the corner of the screen, so make images big and bold. While people listen to your words during a presentation, they can look at the non-verbal content. In addition, large images can break up the text and add some variation so the audience stays intrigued. Keep text minimal. Great presentations include talking and engaging with your audience rather than letting them do all the work. There’s nothing worse than a presenter who reads from his or her slides verbatim. If you include lots of text on your slides, people may try to read it and ignore you, or they may even ignore the slide and read nothing at all. Include only the most important message on the slide and talk about the rest. If you HAVE to include lots of content, try highling the parts you’re talking about as you go. Keep content towards the top. The top of the slide is what your audience will look to first, and there’s no reason to waste good screen space if the audience may not even be able to see it image. Try to keep important content towards the top half of the slide. Remember, if you’re keeping your text minimal, there should be no reason for your text to pour into the bottom half anyway. Reduce bullets. What’s wrong with bullet points? Nothing really, but too many can make the slide feel heavy. Strategic spacing can have the same effect as a bullet point, so there’s no reason to use them unless you absolutely have to. Don’t mix fonts. Yes, it’s tempting to experiment with all the exciting, elegant fonts but combining the wrong fonts is a sure bet to make your presentation look messy. Rather than try to find the right match, just stick to one font and vary the size, shade, and weight. That way, your viewers will not become overwhelmed by all the fluff on the screen. 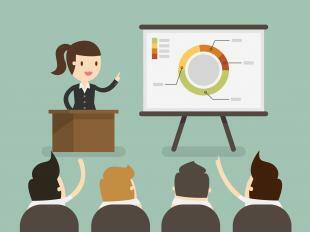 OpenSesame has many great courses for helping you build excellent presentations. Check out Giving Presentations from Jenison or Professional Presentation Skills from Speak and Write, Inc. Building great presentations isn’t hard to do, especially with all the excellent software and tools. All you need to know is how to put them together.